Love these soft colors... Beautiful look. Loveeely outfit dear. Love the sweater you are wearing. Gosh, i am in love with this outfit! That cardigan is a great statement piece! finally you make a post.. love this look.. and amazing photo as always..
What beautiful colors! I love a sweater and a scarf! very beautiful! Abs amazing and stylish look! Love it! I always love how beautiful and cozy your looks are. Great knits! Oh so jealous! I want fall not spring right now! LOL! Love the shades of cream - so cozy and bright all at the same time! You look amazing! Love the coat and the scarf! And those pants are just perfect! I love your outfit here - you look so cozy and comfy. Very pretty. 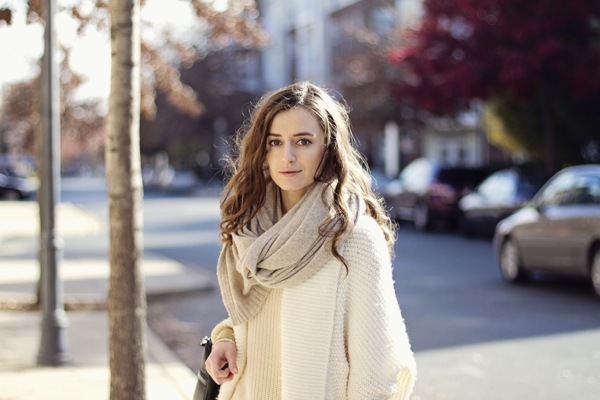 what a cozy and chic look, love that scarf!